There are a number of sports surfaces which could be installed for tennis. Artificial surfacing is a preferred option for many players when compared to all-natural surfacing. The reason for this is due to the permeable properties which come with synthetic surfaces. This means that water can drain through easily and so the facility may be used in all weather conditions. 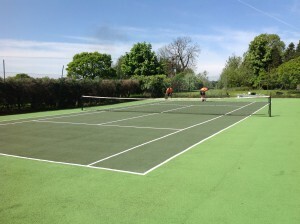 If you are looking for the best surfacing to install, we can offer our thoughts on the top 5 sports surfaces for tennis. If you are interested in having a new sports facility installed, please do not hesitate to get in touch with our team using the contact form provided. Try to give us as much detail as possible about what you are looking for so we can give you the most accurate quote for the work. One of the top 5 sports surfaces for games like tennis is tarmacadam. Open textured macadam is a permeable surface type which allows water to pass through. This means the court may be used as an all weather facility, because the surface will not become flooded in wet conditions. Another great thing about macadam courts is that they may be converted into a multi use games area, as tarmac is perfect for a variety of different sports including netball and basketball. For more information on macadam surfacing, please click here. Another option which is available for these surfaces is EPDM polymeric rubber. Polymeric surfacing is another porous sports surface which can be used for tennis along with various other sports. This type of surfacing is made up of EPDM rubber granules mixed with a specialist binder. This is then laid onto a macadam base and screeded to create a smooth finish. A polyurethane binder can also be installed prior to installing the polymeric surfacing to create a stronger surface and increase the longevity of the facility. Just like macadam surfaces, polymeric courts can undergo anti slip painting to greatly improve the appearance and play of your court. We can apply polyurethane non slip paint in a variety of different colours and then install line markings over the paint to allow for accurate scoring during these games. There are two types of polymeric surfaces: type 3 and type 4. Each of these surface types have different playing characteristics. Type 3 polymeric meets up to a range of accreditations, which is why we recommend EPDM polymeric rubber as one of the top 5 sports surfaces. The third surface type on the list of top 5 surfaces is sand filled artificial grass. Synthetic turf offers similar qualities to regular grass, however it is a permeable surface type. This means that the surface will not become waterlogged or flooded in wet weather conditions. Therefore the facility could be utilised as an all-weather court. Since this surface type offers similar qualities to natural grass, many sports clubs prefer to have this installed for tennis courts. Synthetic turf courts meet up with a number of accreditations and is a durable surface type. That is why this surface is in the top 5 artificial surfaces for sports like tennis. Next on our list is needle punch carpet. Multisport synthetic turf is great for a number of different sports including tennis. Not only does needlepunch have great properties for tennis, but it can also be installed in a variety of different colours. Needle punch carpet is a cost effective option when looking to install sport facilities. Since needlepunch can be used for a range of sports, it is particularly popular in schools with limited space or funds. Needlepunch fibre carpet is a durable and long lasting surface type which has all the latest advancements in technology. 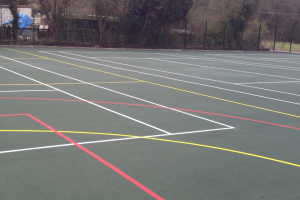 If you’re looking to have a tennis or MUGA facility installed at a cost effective price, needlepunch is definitely one of the surfaces which you should consider. The last surface type on our list of top 5 sports surfaces is artificial clay tennis courts. Synthetic clay replicates the performance characteristics of a natural clay court, which gives players a similar experience when using the facility. Just like the other surfaces, artificial clay courts are porous which means that rain can drain through and so the court can be utilised in all weather conditions. Another great advantage of synthetic clay courts is that they require very little maintenance when compared to traditional all-natural clay. Synthetic clay carpet can be installed straight over existing facilities, such as macadam courts, which makes it a cost effective option for sports clubs, schools and leisure centres. These types of courts also comply with ITF accreditations, making it perfect for tennis. We would love to hear your opinions on the top surfacing types for tennis, so please leave comments in the box provided. If you’re interested in having any of these surfaces installed for your new facility, please complete our enquiry form and we will get back to you with details on costs, prices and specifications. Our team will be more than happy to provide you with a quote for your new tennis facility, once we have received photos and details regarding your requirements.